An interview with Fisher Stevens, the director of Before the Flood, from TIFF. A new breed of female lead; A tale of two Fishers; Penn's hate-watch for the ages; "Paterson" is perfection; "The Salesman" marks Iran's post nuclear deal cinematic resurgence. Contributor Susan Wloszczyna remembers her stepson and the role movies played in her relationship with him. The Ebert Archives: I attend the All-American Picnic at the premiere of "Divorce American Style"
We've been porting my old material over to our new website in construction, and sometimes I come across a blast from the past. Here's a story of a kind now rarely written, about a kind of event now rarely held. It was new ground for me; I'd been the paper's film critic for less than three months. Barry Lorie wanted to know. Columbia Pictures had flown him in from Denver to run the whole world premiere and now here he was without any picnic rules. "You wouldn't get very far with round beans," said Tom Gorman, the public relations man from Balaban & Katz. "Navy beans, maybe . . ."
Then Mrs. Dobson presented Debbie with a large white box. "A little present from the community," she said. Debbie opened it. "Oh, how nice," she said. "A poncho . . . no, a terrycloth . . . is it a beach robe? Yes. How nice. And it would make a great maternity top, too, right?" The women had a good laugh, and then everybody went back out and got into the cars again to go to the picnic. The picnic grounds were, at the 71st St. Park. When the limousines arrived, there were already 1,500 or 2,000 people at the park, half of them lined-up at the gate waiting for Debbie, the rest lined up for free fried chicken. The Continental was mobbed by youngsters with fried chicken in one hand and autograph books in the other, and Debbie, as she got out of the car, whispered, "I may never see you all again." Joe Ragann, the Winston Hills chief of police, organized his force into a flying wedge to get Debbie to the bandstand. And there, on the bandstand, a portable microphone in his band and a battery pack over his shoulder and a red tag saying "Official" pinned to his knit shirt, was Tom Gorman. "I finally figured I might as well run the games myself," he explained, "Who else knows what a sack race is?" "Oh, dear," Debbie said, "that's not until tomorrow." Here is a link to my review of the film. I gave it 3 1/2 stars. It was better than the picnic. 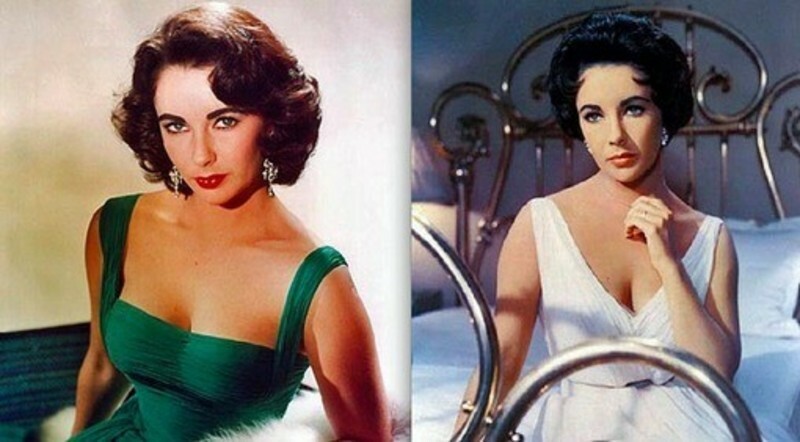 Elizabeth Taylor, who was a great actress and a greater star, has died at age 79. Of few deaths can it be said that they end an era, but hers does. No other actress commanded more attention for longer, for her work, her beauty, her private life, and a series of health problems that brought her near death more than once. View image De Niro in "Casino." Las Vegas is a Hollywood movie. From my piece on Sin City in the Movies at MSN Movies: The world has other gambling meccas -- Monte Carlo, Atlantic City, Reno -- but none as storied or mythologized as Las Vegas, an American dream-zone strategically located in the arid wasteland between Hoover Dam and Hollywood. The neon oasis is a concrete mirage: The closer you get, the more real the place becomes, but when you reach out to grab it, it slips through your fingers anyway. A surreal amalgamation of landmarks historical and imagined (Egypt, New York, Camelot), it rises out of shimmering heat and dust, a dazzling C.B. DeMille monument to profligate waste and the proposition that anything can be purchased or accomplished for a price. Vegas is a Hollywood movie made corporeal, a surreal experience built on sand, powered by electricity, riches and promises of desires fulfilled. The electricity comes from the dam, the money comes from the odds that always favor the house, the desires come from the human heart (as well as a bit lower and to the right). But how sinful can sin be in a place called Sin City, where everything sinful in the outside world is overtly or tacitly permitted? Jerry Seinfeld has been known to enjoy the odd bungee jump, but dressing up like a bee and throwing himself off the roof of the Carlton Hotel in Cannes was new for him. This was last May. The studio attached a steel cable to the hotel, 130 feet in the air, and Jerry glided down to the photographers and bee-lovers below. 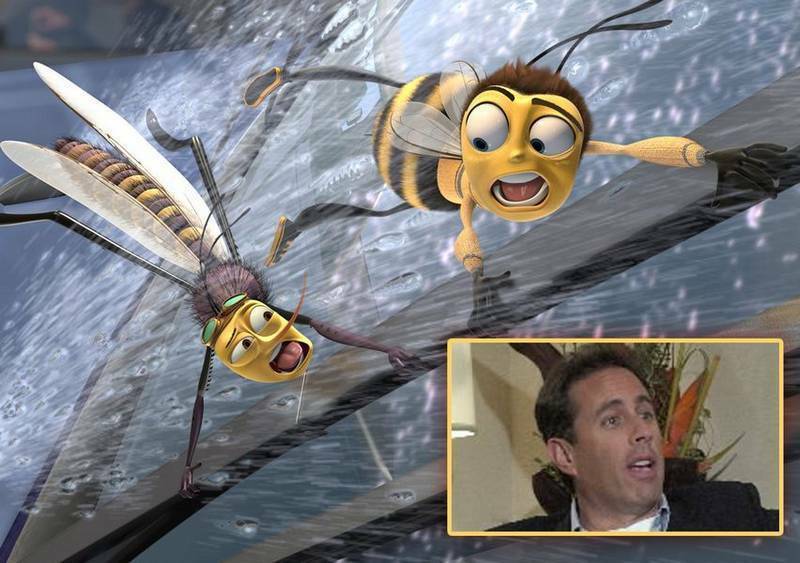 It was a stunt to promote the new animated film, “Bee Movie,” which opens Friday. Q. In your review of Jackie Chan's latest American release, "The Legend Of Drunken Master," you praised his athletic skills but wrote that computerized special effects have made them sort of obsolete: "When you see bodies whirling in air in 'The Matrix,' you don't think about computers, you simply accept them. But what Chan does, he is more or less, one way or another, actually doing."